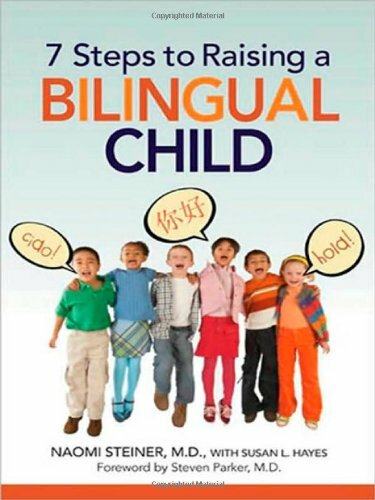 If you are an English speaker living abroad, in a non-English speaking country, you may well have to be the one to teach your children how to read and write in English. Don’t panic! It´s not as difficult as they would have us believe. You don´t have to be living abroad either, maybe you want to teach your little one at home for other reasons. If you have already had a look at all the methods, you will have realised that there are tons of them and quite expensive, as for some reason they are all divided into different books, and smaller reading books, and story books. Somebody said that quite often the simplest solution is the best solution, in this case it is. In the past, before Internet and the advent of the audiovisual, before the information overload era, people used something called “readers”, generally a simple book that would take you through your letters and sounds from scratch into reading basic books. Why did they change the methods? Politics for one, but also, in the last few years there has been a tendency to make lessons different and more “fun”. Fun is good, don’t get me wrong, but it can be distracting as well. Having lots of different songs and resources to teach your child at home can distract you from the target, and it gets quite messy, neither you nor your child know what it is you have to do in each lesson, there are so many different resources and activities to choose from… I’d say pick a method and stick with it, unless you see it really doesn’t work. I’d like to introduce a very simple but time tested method. It is by no means a new method. This book is relatively recent, but it is based on what people have used for centuries to teach others to read, not just English but other languages. It teaches through repetition, it teaches the student the basic sound-letter relationship in the language, and then it uses the other time-tested device for learning, namely repetition, repetition, repetition. No rocket science there. 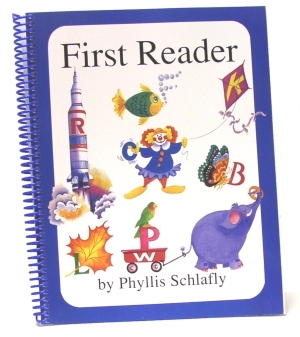 First Reader by Phyllis Schlafly is just a basic reader, it is very colourful, and has lots and lots of word lists to help your child practise his sounds. Each sound is introduced individually and then you practise it with your child by reading the words and sentences. Schlafly recommends doing about 20 minutes per session, I’d say it depends. I am using this book to support my daughter’s reading, actually teaching her, and we do only 10 minutes a day. 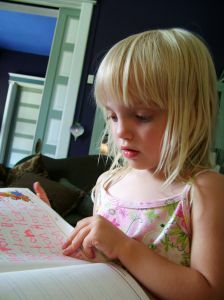 After just a few weeks doing 10 minutes a day, she is reading words and feeling confident. First reader uses “phonics” as well. Which just means that takes you and your child through each sound-letter relationship. It also teaches words that can’t be sounded out, as they don’t follow these rules, and which are high frequency words, so are best learnt by heart. Essentially, it does the same as other “phonics” systems, such as Jolly Phonics or Read Write Inc, the main difference being that First Reader is just one book, which makes it more convenient, and on the other hand you don’t have to spend time learning the rhymes for each “character” or the songs. The main advantage to First Reader is that it gives you lots and lots of words to practice with, words that your child can sound out, so you know you’re building his confidence by virtue of giving him something he can do. It is useful to have flashcards, you can make them yourself or buy them, with the letter and a picture starting with that sound. At the beginning of the session go through the sounds using the flashcards, and then read from the reader. Reading and writing should be learnt at the same time, the movement of the hand helps the student remember the letters and the sounds, and if you ask your child to copy the words he had already read, you would also be encouraging good spelling in future. You can also use dictation, dictate a simple word like cat and help your child break it up in sounds and write them down. Currently in many schools they are encouraging more and more “phonetic writing”, that is they ask the children to write sentences as they hear them, before they can spell everything properly. They believe that it helps them start writing sooner, so they can jot down their thoughts and take an active role in their learning. However, in my opinion, it’s not necessary for a kid to be writing very early, so why can’t we be patient and teach them to write at the same pace, slowly, but spelling words appropriately. Start by writing words that can be written following the phonetic rules and the ones that don’t but can be memorised. Once you have got a few sounds under your belt, you can get your child reading decodable books. These are books written using words that follow the phonetic rules, so basically the words have been selected especially. They may be a bit repetitive at first, but it will give your child the confidence to build his reading ability. 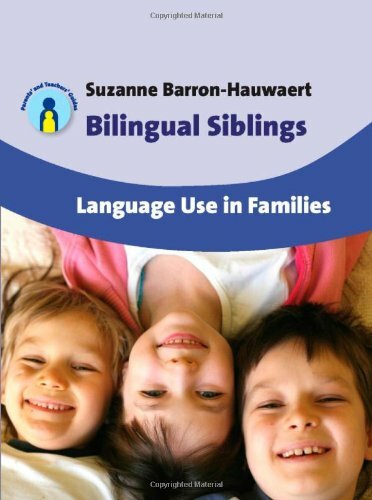 Some children are fine reading “normal” basic books, but you must be aware that these are not written in a decodable format, and they may encounter words that can’t be decoded or are more advanced that the sounds and rules they have learnt. Most children will just “learn” the image of the word, which will help them reading them, but some children may get frustrated and confused if you give them something that is not “regular” and they can’t understand. If that is the case, hold fire for the “normal” books, stick with the decodable books, and introduce him to those books later on. This doesn’t mean that you can’t read normal books to him, it just means that he will be taking it a step at a time. Many books used in schools for the basic levels are based on repetition of words and they link the words to the image. You have to be careful with this, some children will not be reading but guessing the words from the images. In the short term it seems like a good solution, the kid seems to be reading. However, it is very unlikely that he will remember those words in a different context, and as we all learn through patterns and organised structures, this method will not help much your child learning general implicit rules, given that he’s just learning that in “that book” the word he can’t read is the image in the page, but that’s not much help with other books, or with reading in general. Some kids do learn by memorising the “picture” of the word. However, this may not be the case for everybody, and also if they are not able to learn the implicit rules they may have problems with more advanced reading later on. First Reader by Phyllis Schlafly is not the only one, but it is a very good all-in-one method. The main drawback at the moment is that it can only be bought through the Eagle Forum bookshop and they only ship within the USA. I got my copy shipped to a friend, who then forward it to me. It is worth the trouble, and it’s only $29.95, which compared to having to buy lots of different books in a system is quite reasonable. Or maybe why don’t you drop an email to the Eagle Forum and ask to make it available abroad? You may be able to get a used copy of the old hard back edition on the Internet. To see some samples of the pages inside check out the First Reader website. which contains tons of useful information, thanks for providing these statistics.